We had a fabulous time exploring Andalucía / Andalusia and the coast of Southern Spain during our road trip from Sevilla / Seville. Our plan was to drive through the mountains for the first half of the week, dropping down to the coast for our return journey. We took a night flight into Sevilla from Lanzarote to start our week on the Peninsula, we didn’t plan any time for this city, as we’ve visited twice before, so we set off for Granada (250km via the A-92) after breakfast. Once we left the city of Sevilla behind it was fascinating watching the countryside rolling by, the central reservation was planted with Bougainvillea which was in full flower for over 100km! One of our holiday clients had given us a tip to stop in Antequera which was a pleasant place to stretch our legs after 160km. We didn’t have time to see the Dolmen’s, Laguna de Fuente (flamingo lake) or the Torcal de Antequera (nature reserve & limestone formations) as we didn’t want to compromise our time in Granada. We were staying at the Allegro Granada in room 409 for our overnight in Granada, we checked in and walked around the corner to the bullring for lunch at Plaza Tapas. The tapas bars are fantastic in Granada, simply order a caña and a generous tapa will follow! This bar gave us a choice from their tapas menu, others simply presented their dish. We set off walking to the Alhambra 2 hours before our allocated time to visit the Nasrid Palaces, and only just made it with 10 minutes to spare! It’s not very well signposted and the entrance is the furthest point away from the centre, so we walked all the way up, to walk back down the hill inside. The palaces are stunning, it’s hard to capture all the intricate detail with photos. We regretted not buying entry into the Alcabeza too, as this is the place to capture the sunsetting over Granada, but we will be back to explore this fabulous city in more detail. Our second day takes us from Granada to Murcia, a distance of 278km via the A-7. We climbed up out of Granada with some stunning views over the Sierra Nevada, there’s a remnant of snow even in the heat of July. We broke our journey up with a coffee stop and a wander around Baza. We’re staying the the Occidental Murcia Siete Coronas, a modern hotel on the bank of the Rio Segura. our room 608 on the top floor was spacious and comfortable. We found a fabulous place for a menu del día, and enjoyed a walk around Murcia to see the cathedral and dined at El Pulpito by Plaza de las Flores in the evening. On day 3, our overnight stop was in the old town of Alicante, however we drove further up the coast to visit Altea (a tip from a friend) this resort has been likened by others, to Santorini in Greece and Positano in Italy. We drove 139km on the A-7 and AP-7 (toll road) to Altea and returned via Benidorm 46km on the famous East coast road N332 in the Costa Blanca. We visited the Santa Barbara castle to enjoy the view, before checking in at the elegant Hotel Boutique Alicante Palacete S.XVII. Our room was 104, which benefits from 2 balconies and facing the concatedral de San Nicolás de Bari. We walked along the Paseo de la Explanada de España with it’s distinctive wave tiled mosiac, paused by El Postiguet beach to watch the world go by, then continued along the marina, returning along the quirky tapas street Calle San Francisco. We dined at El Portal, which was one of our memorable meals of this trip. We really like Alicante and will be back, it has a great vibe and some fabulous restaurants. Day 4 was a long drive along the coast 290km from Alicante to Almería. Our car was parked beneath the Mercado Central food hall in Alicante, so we had a quick nosey around the 292 stalls before hitting the road. We paused in Cartagena to stretch our legs, before meeting a colleague for lunch in Puerto de Mazarrón at Viggos which is popular for their menu del día. It was interesting to see that this area of the Costa Cálida has low key tourism, with apartment rentals and small hotels despite the stunning beaches stretching for miles. 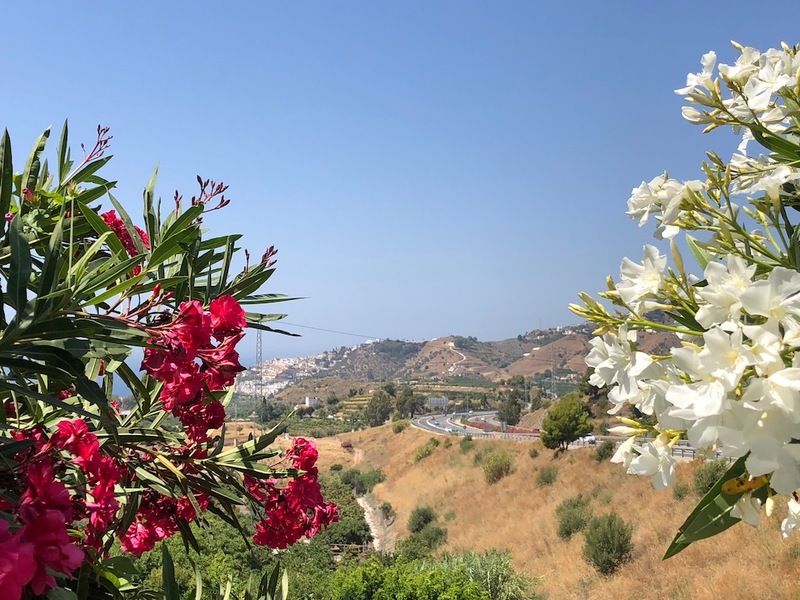 We made another stop at Mojácar during the afternoon drive, as we had a couple of tips to include this place in our journey. It’s a great view over the valley of the pyramids from up there, and some interesting streets to walk around. We had a nice surprise on our arrival at the Barceló in Cabo de Gata when we were allocated one of their premium sea view rooms 113, which have been recently renovated. It’s very quiet in this area, a great place if you just want an all inclusive beach hotel to chill out at, but there’s not really anything to walk out to, bar a few restaurants around the artificial lake. Day 5 we explored the coast in the natural reserve of Cabo de Gata, this was a tip from a regular visitor to Lanzarote. We spotted flamingos on the salt flats and found miles of unspoilt natural beaches. Our drive today was 147km to Nerja for lunch, before continuing 95km on to Fuengirola for our final hotel. The Doubletree by Hilton Reserva del Higueron is great for a chill out, sports or gastronomy holiday but it’s in a strange location, on a steep hillside and residential area some 8km from the resort. Day 6 we drove into Fuengirola for breakfast at the popular Cafetería Costa del Sol for freshly squeezed orange juice, hot chocolate and churros followed by a walk along the front. The beaches were spotless, freshly swept, lots of toilets, free Wi-Fi it was impressive despite being early on a Sunday morning. For our last day we were heading up into the mountains to walk the Caminito del Rey. This is a stunning 7.7km walk which you have to book well in advance, and an experience we highly recommend, we loved every step. On the drive back, we stopped in the pretty town of Mijas for tapas, our last tip for this trip from a holiday client. We ordered gambas pil pil which are called gambas al ajillo in the Canary Islands, as well as the house salad which included fresh oranges and dressed with yoghurt.